﻿ PORTWELL RELEASES A BASIC COM EXPRESS MODULE BASED ON INTEL® XEON® PROCESSOR D PRODUCT FAMILY- Portwell, Inc. Portwell.Inc., (http://www.portwell.com.tw) a world-leading innovator in the Industrial PC (IPC) market and a Premier Member of the Intel® Internet of Things Solutions Alliance announces the release of the PCOM-B634VG, a Type 6 COM Express Basic (125mm x 95mm) module based on Intel® Xeon® Processor D-1500 family. The COM Express module has optimized value models and service levels by running networks applications securely and reliably on virtualization-optimized platforms. Portwell's versatile COM Express modules respond to the ever-evolving network and IoT use cases by enabling designers to partition commodity host-processors from proprietary baseboards, thereby minimizing current and future design risks during the initial phase of development. This design of separating the CPU-upgradable module from system specific I/O carrier boards further safeguards development investments and lowers total cost of ownership. In addition, Portwell can also provide services to clients on carrier board design and development, schematics and BIOS customization. At Portwell, we strive to create superior products for our customers. 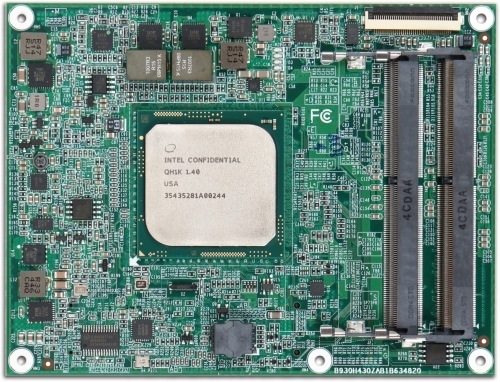 Portwell PCOM-B634VG is designed with Intel® new Xeon processor with 16 CPU cores and DDR4 ECC/Non-ECC SO-DIMM support which provide high CPU computing, excellent Ethernet performance. Extend PCIE Gen3 ports in PCOM-B634 can support high speed IO card for more application. With VGA and legacy interface support, customer can upgrate system easy and fast.